Company E, 16th Infantry, 1st Infantry Division lands on Omaha Beach in Normandy from the U.S Coast Guard-manned USS Samuel Chase June 6, 1944. 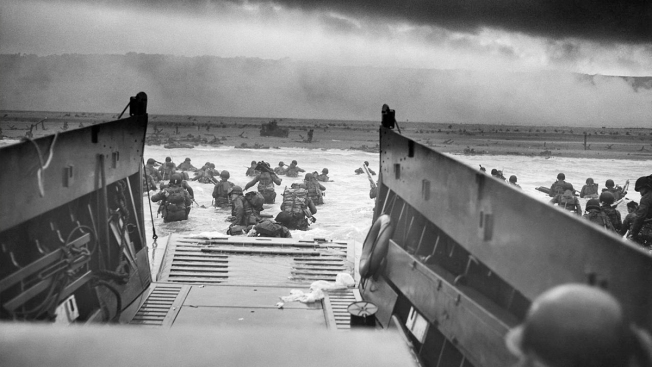 Tuesday marks the 73rd anniversary of the pivotal D-Day invasion of Normandy in World War II. Also known as Operation Overlord, the invasion on June 6, 1944, consisted of 150,000 Allied troops pushing onshore during the pre-dawn hours in less-than ideal weather. The sky was overcast that morning and the wind was brisk. The gusty winds churned the sea, resulting in 3- to 6-foot waves (making many troops seasick as they bravely went into battle). Even though the weather was unfavorable, these conditions were considered a vast improvement from the weather the day before. In fact, the originally date planned for the invasion was June 5, but relentless rain and wind that day before forced General Dwight Eisenhower to push the invasion back to the 6th. June 7 would have been the absolute latest Eisenhower could wait without postponing the entire operation for weeks, as it was imperative the invasion take place in low tide (June 5-7). The Germans had heavily fortified the shoreline with obstacles designed to shred the bottom of landing craft. Landing in low tide was the only guarantee the Allies could see and avoid these hazards. The downside, of course, was that it forced the troops to disembark in waist-deep water and wade ashore. This slow, cumbersome approach led to many deaths and casualties. While low-tide was a necessity for landing craft, the airplane pilots preferred a full moon to help illuminate targets. The two could not go hand in hand though. A compromise was decided upon, midway between high tide and low tide, shortly before dawn. Even after all the strategic planning of low tide, moon phase and time of day, the operation was still at the mercy of the weather. The forecast leading up to the morning of June 5 was perhaps the most important forecast of the war. Keep in mind that the meteorologists back then didn’t have the computer models, satellite, or radar technology we have now. Amazingly, they were able to predict a critical break in the storm 24 hours ahead of time. This forecast allowed for the Allies to heroically take hold of the beach that day and made way for hundreds of thousands additional troops in the days to come. It was indeed a decisive point in the war and in history.